Trump: Does someone who wore a ‘No Fat Chicks’ t-shirt have the moral authority to order a military coup? It’s a question. Whether it was asked in the debate between Donald Trump and Hillary Clinton has nothing to do with it. This is how the UK sees the US presidential race: “Would you like to chew on my weird hair?” v “I see dead people”. Most scandalous of all is the fact that the subtext to all of this nonsense is so serious it could be deadly. Whoever gets to be president-elect after the vote in November will most likely have to try to sort out a peaceful solution to the current tensions between the West and Russia, that have flared up massively over the war in Syria and Nato military movements on Russia’s western border. They will have to find a way of reconciling the hawks in the US military-industrial complex with the bears in the Russian government. That is, of course, if we all manage to live that long, nuclear trigger-fingers being as itchy as they are. 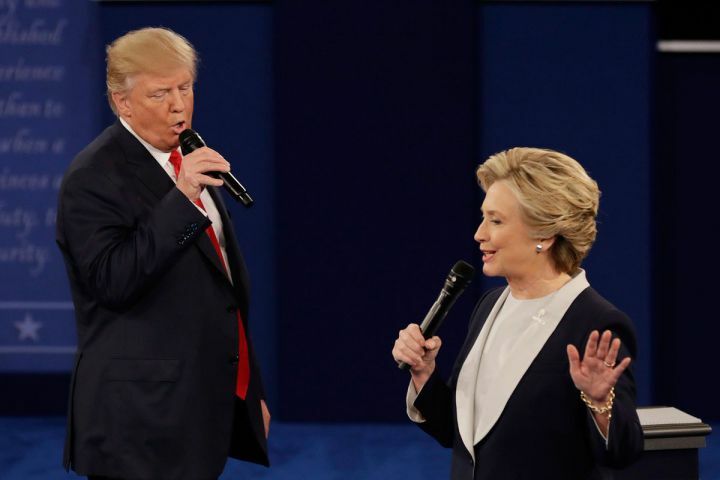 The world’s audience awaited, as the two contestants in the grand final of ‘Who Wants To Be A President?’ reached its penultimate stage. First, the moderators canvassed the two candidates’ political commitments. Whereas Trump averred that “It’s time to make America America again”, Clinton demurred “America is already America because America is already America”. It wasn’t just the candidate’s policies which were clarified, however – we got to know them on a personal level, too. While Trump asked the audience “Would you like to chew on my weird hair?”, Clinton simply stated “I see dead people”. At this point, the debate become more heated. Trump stressed the need for America to invade certain countries in North Africa, steal their natural resources for the United States’ own benefit, and – in the process – commit a number of war crimes. Many – if not most – pundits were agreed, however, that this was an example of mansplaining, and therefore injudicious. On much the same tack, Clinton asked undecided voters to consider a series of questions: first, whether a man like Trump – who has such anachronistic views on sexual equality – was really a suitable person to oversee the export of modern weapons to friendly dictators, for them to use on crowds of civilians. Second, whether somebody who once wore a ‘No Fat Chicks’ t-shirt at a frat-party possesses the moral authority needed to order military coups, occupy foreign countries, and supply allied war criminals with imprecise munitions. Finally, Clinton asked whether or not Trump’s attitudes towards women might indicate that he simply isn’t patriotic enough to hand suspected foreign terrorists over to the CIA, to be tortured. The evening drew to a close. Viewers were asked to cast their vote – unless watching on a +1 hour channel, in which case their votes wouldn’t count, but they may still be charged. Whatever the outcome of this ‘election’, gawd help us! This election should have a third option, saying none of the above and a reselection of candidates. There is something fundamentally wrong with a political system when a nation of 134 million people wind up with a choice of Trump or Clinton. Only 134 million? I thought it was well over 300 million.